Synesthesia dates back to the 17th century. The most historically known and described form of synesthesia is the one who involves the sense of vision and sound. The interest in colored hearing is a phenomena dating back to Greek antiquity where it was commonly referred to as synesthesia in art. In 1812 a German physician, Sachs, was the first one to medically mention synesthesia in his thesis. Since then, other studies have been conducted in educational and medical areas, both having remarkable results. Those studies led to the formation of associations of persons for and with synesthesia such as the American Synesthesia Association founded in 1995 and the UK Synesthesia Association in 1993. Synesthesia is a neurological condition in which two or more senses are attached. 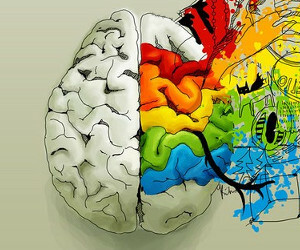 People with synesthesia have a relationship between the senses. The excitement of one sense stimulates the experiencing of another. It is estimated that one in every 10,000 people has synesthesia but recently this estimation has been doubted because is a very low ratio considering the number of reported cases. The specific cause of synesthesia is still unknown. However, there are speculations that many crosstalks between the regions of the brain that are responsible of the senses functions may be the cause of several types of synesthesia. Cross-activation appear due to a failure in pruning. Pruning is one of the major methods of synaptic plasticity. It handles the partial elimination of connections between regions of the brain during its developmental process. Feel those sensations since they can remember. Environmental projection of sensations not just in the mind, the person actually can feel it. For example, they can taste words or see colors listening to music. The sensations are consistent, generic and durable. For example, the sound of a bell stimulates a red vision every time. The feelings are usually emotional. Experiencing the sensations causes ecstasy and emotional fulfillment. Despite the existence of over 20 types of synesthesia, only a few has been discovered, studied and documented. The following are some of the most common known forms of synesthesia. Chromesthesia is a neurological condition affecting about 1% of the world population. Individuals with this condition involuntarily associate the sounds they hear with certain colors. The type of color evoked by a particular sound varies from one person to the other. People with grapheme synesthesia involuntarily associate specific colors with letters or numerical digits. The associations are not normally related with sophisticated imaginations but with a color of a letter or some simple geometric patterns. Hearing-touch synesthesia is a very rare condition. Individuals that experience this condition are susceptible to the sense of sound and they develop tactile feelings whenever they hear sounds. A good example to illustrate this phenomenon is the claim by some people who feel physical discomfort with the background noise of a plane. Others are more sensitive to sounds of very high frequencies that cannot not be perceived by others. Lexical-gustatory synesthesia is the taste of words. To them, words have characteristic tastes ranging from delicious to disgusting tastes. Mirror touch synesthesia can be seen as a form of empathy. People with this type of synesthesia feel exactly what others feel such as pain and pleasure. The difference between this condition and empathy is that mirrored feelings go beyond the emotions and they are physically experienced by the synesthetes. People with number form synesthesia usually have a mental map of numbers appearing involuntarily with every thought of a numerical figure. Their high memory and ability enables them to accurately quote events in the past and project them to the future. Ordinal linguistic personification also called OLP or just Personification is a condition in which people involuntarily and uniquely associate ordered sequences like the months of the year, days of the week, numbers or even letters with behaviours and character traits of personalities. The time-space synesthetes are people who feel like time has a physical characteristic. They feel a literal connection with time. In their memory, they interact with time. In their world, they can physically point at specific days and time in space. People with touch-emotions synesthesia experiment extraordinary physical emotions when they touch some surfaces or textures. Though it was a rare occurrence in the past, it has been discovered that more people have this conditional than it was originally believed. The most common test for synethesia is the test-retest method. It consist in do a test to detect a form of synesthesia and then redo the test later without notifying the synaesthete. The results are then compared for consistency. In most cases, the synesthetes score as high as 90% after retest and non-synesthetes' 30-40%. Another test that is used for synesthesia is a modification of the cross-sensory stroop test, those modifications consist in adapt the test to study the relation between colors and words, music and color, musica and test and so on. Most people with synesthesia are talented musicians, instrumentalists, songwriters and film characters. Among the most commonly known persons with synesthesia are Marilyn Monroe, Jemi Hendrix, Steven Wonder, John Mayer and Patrick Stump.